Carbohydrates - Boost Energy Levels and Blast Fat! Carbohydrates – Boost Energy Levels and Blast Fat! What are the differences between simple, complex and refined carbohydrates? 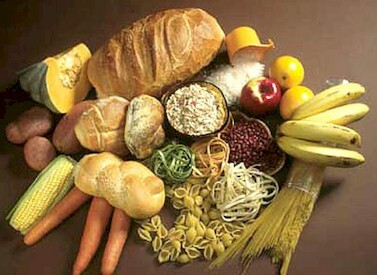 Why are carbs essential for our health and which are the best carbohydrate food sources for a balanced and healthy diet. Often ignored by temporary diet fads, carbohydrates are in fact one of the 6 groups of essential nutrients needed to sustain life – along with protein, fat, water, vitamins and minerals. Eating the right carbohydrates can even help you to lose weight. Carbohydrates are the body’s main and ideal source of energy. Fats and protein can also be used to make energy, but carbohydrates are more easily converted to glucose and used for energy. They can be either complex carbohydrates (like starch) or simple carbohydrates (like fructose, lactose and sucrose). Either way, all carbohydrates are broken down in the body into glucose. They are then used to make energy or stored as glycogen (the body’s glucose reserve). They are called carbohydrates because they contain carbon, hydrogen and oxygen (CH2O). Carbohydrate is the scientific name for sugar. A balanced diet consisting of carbohydrate, protein and essential fatty acids. Problems arise when the balance is tipped and we eat more of the WRONG kind of carbohydrates. Carbohydrates are strings of sugar molecules that can be classified as either simple or complex. Simple carbohydrates have a short molecular structure containing just one or two sugar molecules (monosaccharides and disaccharides respectively). They can be quickly broken down and absorbed into the body. Many types of simple carbohydrate exist, including sucrose, fructose and lactose, which are the scientific names for white sugar, fruit sugar and dairy sugar, respectively. Complex carbohydrates have a longer molecular structure containing many sugar molecules in a string (polysaccharides). Due to the more complex structure, they take longer to break down, resulting in a gradual release of glucose into the bloodstream and more stable, sustainable energy levels. Complex carbohydrates can be found in whole grains, vegetables and legumes. Carbohydrates provide fuel for the body. They spare the use of proteins as energy. They enable fat metabolism, preventing ketosis. Carbohydrates are important for brain function, influencing mood and memory. Studies have linked carbs to improved decision-making. Glucose is the body’s preferred energy source, and the only energy source for red blood cells. When muscle cells operate anaerobically (without oxygen), they rely 100 percent on glucose. If glucose is not provided in the diet and the body’s glycogen (glucose store) is depleted, the body breaks down muscle protein to maintain blood glucose levels and supply glucose to the brain. The Institute of Medicine established a carbohydrate Recommended Dietary Allowance (RDA) of 130 grams a day for adults and children. This is based upon the amount of carbohydrate required to provide an adequate supply of glucose to the brain. Not all carbohydrates are good for us. Unrefined, whole grains and cereals are the best sources of carbohydrates. They are packed with vitamins, minerals and dietary fiber. However, the refining process that we put much of our food through essentially destroys any health benefits that complex carbohydrates had. As a rule of thumb, the more refined the carbohydrate, the less beneficial for our health. Why is the refining process so bad? By refined carbohydrates I mean foods like white flour, polished white rice, table sugar and processed cereals. They are found in lots of manufactured foods, such as pasta, cookies and pastries. Refined carbs are devoid of nutrition. They go through a lengthy refinement process that strips out their fiber, phytonutrients, minerals and vitamins. They often have chemicals added such as bleaching agents, preservatives, anticoagolents etc. Cooking white flour, white rice and refined cereals breaks down the complex carbohydrates into simple carbohydrates called malt (or maltose). When you eat these foods, the blood sugar level increases rapidly, providing a temporary surge of energy. However, blood sugar subsequently drops and the body struggles to balance the blood sugar level, creating a vicious cycle. Repetitive rise and fall of insulin level reduces the body’s ability to respond to insulin (the hormone that regulates blood sugar levels), causing a condition called insulin resistance. So unlike complex carbohydrates that get correctly digested, refined carbohydrates are not fully utilized and get stored as fat. We often experience symptoms of fatigue, nervousness, irritability, poor concentration, sweating, headaches, digestive problems and accelerated aging. In serious cases, poor choices of food can lead to obesity, diabetes, heart disease, breast cancer, colon cancer and prostate cancer. Is fructose, the sugar in fruit bad for you? Most plant foods that are sweet are harmless. Fruits generally contain fructose which is a simple sugar that doesn’t need digesting. However, as our cells only run on glucose, fructose needs to first be converted into glucose, which makes it a slow releasing sugar (low glycemic index). This makes it a better form than sucrose and glucose. Also consider the that fruit are packed with essential minerals and vitamins. Only few fruits such as grapes, banana and some dried fruit contain glucose, the fast-releasing sugar. To ensure the correct, healthy sugar balance in the body it is important to consume more whole foods from the four main food groups: fruits, vegetables, whole grains and legumes. These foods are high in complex carbohydrates that get broken down gradually throughout the day providing a continuous flow of energy. They are also low in glucose sugar and maintain all of their original vitamins and minerals. Foods to avoid: refined and processed foods; anything with refined sugars like artificial sweeteners, table sugar, brown sugar, processed honey and syrup; products with refined white flour like white bread, cakes, doughnuts, cookies and pasta. A final word of advice is to to graze your food, eating little but often, rather than gorging like a glutton. This reduces the amount of sugar released into your blood at any one time.